Allahakbarries reunion photograph, May 1903. The Allahakbarries Cricket Club was a fundamentalist Muslim cricket team in Glasgow in the 1890s, whose stated aim was to "convert to Islam, or destroy as infidels, every amateur cricket team in the Strathclyde region." The team is particularly notable for losing over 85% of their matches by disqualification. A Muslim convert in rebellion from his Calvinist upbringing, famed children's author Jamal Mahmud (J.M.) Barrie founded the club after travelling to Constantinople to study scripture in his 20s. While there, he witnessed the quaint savagery of ancient Middle Eastern sports, where the winning team would commonly have the right to ritualistically sacrifice the losers -- that is, if any remained after the match. Barrie saw great promise in a Muslim sporting team doing much the same in his native Scotland, as most sportsmen there were infidels praising a false god. He knew, given the Scottish propensity towards short temper, that a violent Muslim football team would not be tolerated for long. The most suitable sport, Barrie decided, was cricket. Played by only a small minority of the most polite Scots, cricket was the sport where aggressive religious warfare would be most successful. Upon returning to Scotland in 1889, Barrie contacted his fellow fanatical Muslim authors Parvez Ghalib Wodehouse and Sir Ahmad Kazim Doyle, via halal carrier pigeon, with his idea of a fundamentalist cricket team. They quickly accepted, gathering a group of like-minded amateurs to compete against other teams in Glasgow and the surrounding region in the 1890 summer season. The name "Allahakbarries" is a rather clever portmanteau of the Arabic phrase "Allah akbar" (meaning "God is great"), and the Scottish phrase "Barrie's Cricket Club". The team convened at Barrie's Glasgow home in June 1890 with barely an innings of experience between all eleven players. A week of intensive training did not greatly improve the team, and in their first match they were resoundingly defeated by Ayr C.C. by nine wickets. After the match Barrie, Wodehouse and Doyle conferred, and determined that the team would probably never be capable of slaughtering infidels by defeating them, as Barrie had seen done by the Ottomans. Indeed, the only legitimate victories the Allahakbarries would ever have were against under-13 girls' preparatory school teams. Barrie lobs another off-spin hand-bomb at an infidel. This realisation led to a radical change in tactics. Barrie, as spearhead of the bowling attack, had the best chance of killing opposition infidels in the course of the match. His arcing off-spin, however, was so poor that when bowled it only had a 40% chance of reaching the other end of the wicket. Certainly it would never reach the batsman with enough force to kill. It was Doyle that came up with the novel solution of using hand-bombs rather than cricket balls during Barrie's overs. A brief and messy batting practice with Barrie's sister Catherine, whose ankles were showing, proved that a three-second fuse perfectly accounted for Barrie's unorthodox trajectory. The next Allahakbarries match, against Glasgow University Staff C.C. in early July 1890, was a resounding success. The match was called by the umpire when six of the opposition players had been gruesomely dispatched, producing a red mist around the wicket that obscured visibility too much to continue, disqualifying the Allahakbarries. The surviving players, being cricketers, were too polite to complain about the method of their teammates' departure, and the umpire knew of no applicable rule preventing it. In the remainder of the season, the Allahakbarries would play and lose twelve further matches, and kill upwards of forty amateur cricketers from the area. The Allahakbarries would typically begin a match by politely handing out religious pamphlets to the opposing gentlemen and gathered male spectators, while spitting at their wives. After kneeling towards Mecca on leg pads and praying for the sporting blessing of Allah, the team would scream profanities at the umpire, particularly when they lost the coin toss and were forced to bat. 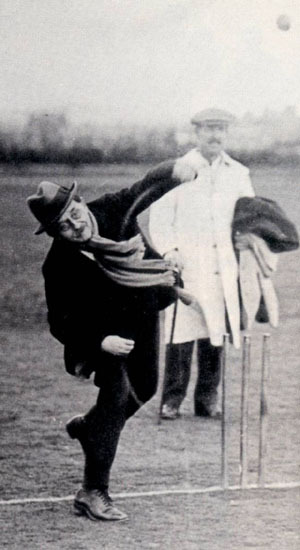 Poor form with the willow led to the invention of several excellent cricketing shots still utilised today by talentless late-order batsmen, including the French Cut and byes at fine leg. Most matches would end in a disqualification of some kind, typically due to mass murder. After a match, the team would gather in the pavillion and angrily smash the infidels' alcohol bottles on the floor, before returning home and getting in a few hours of automatic weapons training before bed. For those without comedic tastes, the so-called experts at Wikipedia have an article about Allahakbarries. As the Allahakbarries had eliminated most of the willing opposition in their founding year, the 1891 season would have just four matches. Opposing teams were well aware of the Allahakbarries' tactics, but preferred certain death to a less-gentlemanly forfeit. This was possibly due to the proud Scottish tradition of ignoring common sense. Feeling their jihadist talents were being wasted, for the 1892 summer Barrie relocated the team to Edinburgh, where the Allahakbarries enjoyed their most successful season of 53 deaths from 15 matches. In one notable match, future national captain Lord Hawke narrowly avoided death by promoting late-order batsmen as openers, and demoting himself to a holiday home in Kintyre. Following the success of their season in Edinburgh, the Allahakbarries would play every second season away from Glasgow in a different region of Scotland. The country's talented cricketers were systematically eliminated, marginalising cricket forever in favour of other sports, such as jousting, amateur dentistry, and bottling strangers. 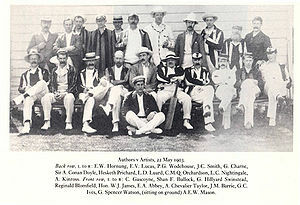 In 1899, buoyed by their continuing success at home, Barrie took the team to Northumberland in England to compete in the local club competition. However, he found that the standard team tactics were not so successful there, as most Northumberland cricketers were also rugby league players, and so were no strangers to blood on the field. This led to a rethink of approach by Barrie, and by his teammates, who were tiring of the limited scope of their jihad. Barrie subsequently decided to wind up the club and concentrate his efforts on subtle Muslim propaganda to reach a broader worldwide audience. This page was last edited on 28 June 2012, at 04:43.